Its the end of the year and every child or almost every child are busy getting themselves prepared for the year end exams. For some Primary 1 students they do not have any tests/exams, for others like DinoBoy, the school have "Holistic Assessment Tests" or whatever term the school prefer to call it. We are taking it slow and instead of stopping all leisure enrichment classes temporarily till after the assessment tests, we started art lessons at heART Studio again today~ After being away since June 2013, DinoBoy was very happy to be back at the studio. 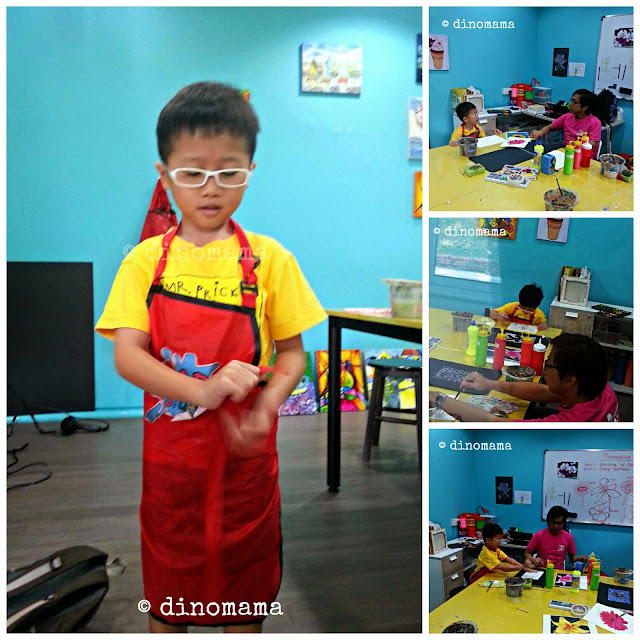 He couldn't wait for me to put on the art apron for him and took some time to settle down in Teacher Gaz's class as he was going around chatting with Auntie Jennifer, Teacher Shafiq and Teacher Elma. He eventually calmed down and focuses on creating his art work. It was a busy day, we had a quick lunch after the art lesson and made our way to for his swimming lesson back at our neighbourhood. Today's lesson was pushed forward for half an hour as the swimming complex will be closed early for company event. Despite the rush, we arrived at the swimming pool earlier then we expected and DinoBoy is able to play in the pool for half an hour before the lesson. Don't worry, there were at least an hour between his lunch and the swim so there is no risk of him getting a tummy ache or vomiting. As you can see, he is clearly enjoying his swimming. He is still learning free style after about 2 months but we are taking it slow too. His Coach says that he is making slow progress but at least now he does not flare up in frustration when he is unable to do it correctly after a few lessons or few tries. This is what I want, to truly enjoy swimming and not get all stressed up and ended up with no progress at all. Keep it up son! 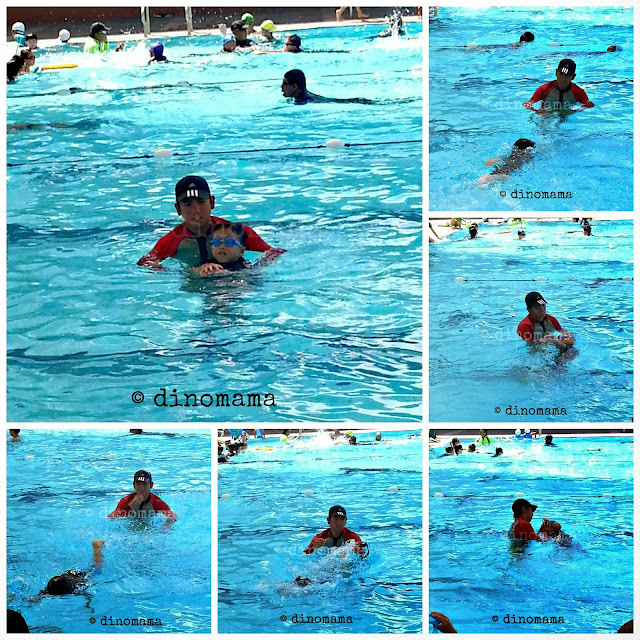 It was a hot hot afternoon, and while DinoBoy is in the pool I was reading my book under the shade. I took this time to unwind myself and relax my emotions, it was a good hour as I was able to read 2 chapters of the book plus taking some notes on some important points. I had this book earlier this year but did not have a chance to read it till now, I have too many books still waiting for their turn, I really must buck up in my reading and perhaps stop buying new books. We ended the afternoon with an early dinner at Mcdonalds before heading home to laze around for the rest of the day. Now that DinoBoy is back to his art lessons, I hope both the art & swimming classes will be able to help him destress and eventually his temper tantrums will be gone. Do you have a special way or method to destress yourself or your child after a long day? Do share with us, perhaps I can adopt your methods too. 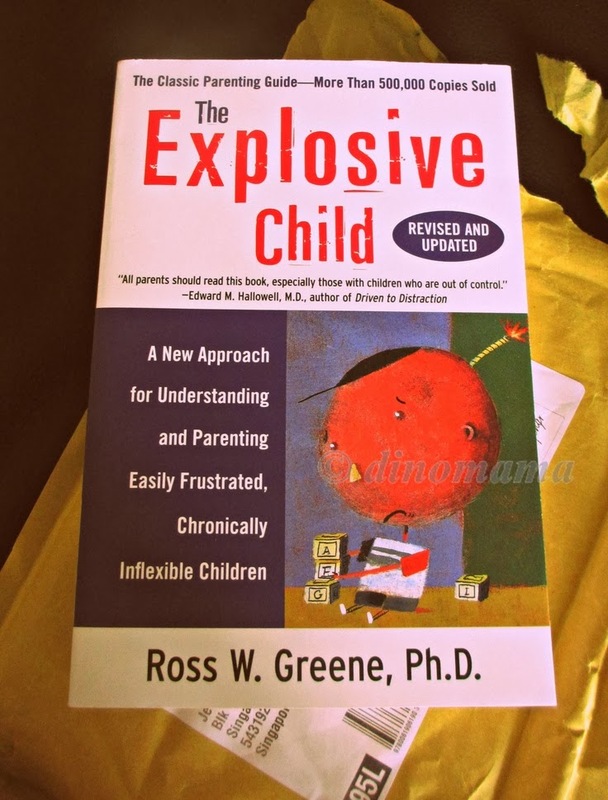 I have or rather used to have an explosive child thus I got this book. Only read and finding it really useful already. Very interesting post. It's good to keep your child creative and active. So many parents are putting their kids in front of tvs and ipads. Other people may try to give you suggestions for your situation, but you know your son the best. Find the things that he enjoys doing, like drawing or looking at books, and offer it to him when he feels frustrated. I'm really glad that my son knows now how to calm himself down and find ways to distract himself instead of flaring out at his friends or teachers. Very interesting. It's good to keep your child active and creative. Some people always place their kids in front of tvs and ipads, thinking it's helping them out. I'd say just find the one thing he really enjoys and offer it to him when he gets frustrated. You are the only one that knows best for your son. Out door fun all the way, for me a bike ride for the kids anything, even a bounce on the trampoline but some outdoor time and not too structured is great for destressing.